Headless Bundles, disable languages, improves fast render mode, and much more. 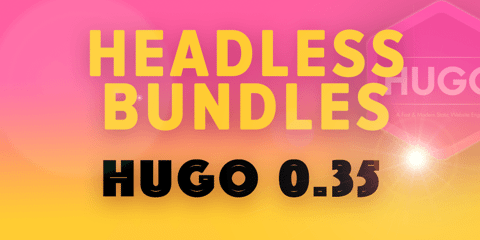 The most notable new feature in Hugo 0.35 is perhaps Headless Bundles. it will not be part of .Site.RegularPages etc. But this release contains more goodies than possible to sum up in one paragraph, so study the release notes carefully. It represents 42 contributions by 8 contributors to the main Hugo code base. @bep leads the Hugo development with a significant amount of contributions, but also a big shoutout to @vassudanagunta, @yanzay, and @robertbasic for their ongoing contributions. And as always a big thanks to @digitalcraftsman for his relentless work on keeping the documentation and the themes site in pristine condition. Many have also been busy writing and fixing the documentation in hugoDocs, which has received 28 contributions by 5 contributors. A special thanks to @bep, @kaushalmodi, @regisphilibert, and @salim-b for their work on the documentation site.